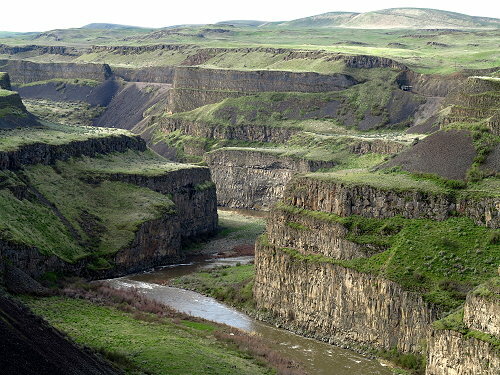 Palouse Falls as seen from the parking lot. Tuesday March 31: After a two-week setback because of Clifford’s health – was it the flu, we really don’t know – we are finally on our way today. We have breakfast at the Red Light Garage so as not to dirty any dishes, and finish packing the Blazer. In Kellogg we stop at the clinic for another blood test for Clifford and Coeur de Alene for gas and fill up the propane that will be our source of fuel for cooking and staying warm. 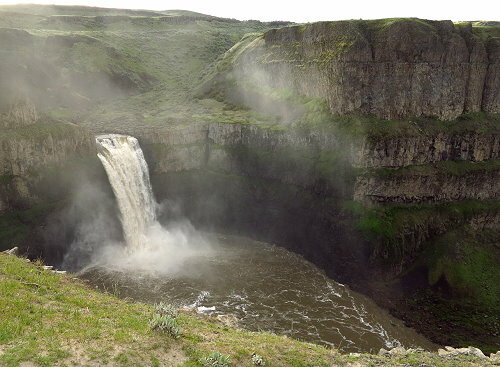 At Spokane we head southwest: destination is Palouse Falls State Park in southeast Washington. Thanks to my research and phone calls, I have found an available and affordable place for us to stay on this part of our route. Not many campgrounds are open in March or early April and there are no national forests as fallback in this part of the country. The barren landscape is more attractive than it was when I was here in February, now having a sheen of green from grasses beginning to grow in this prairie-almost-desert region. 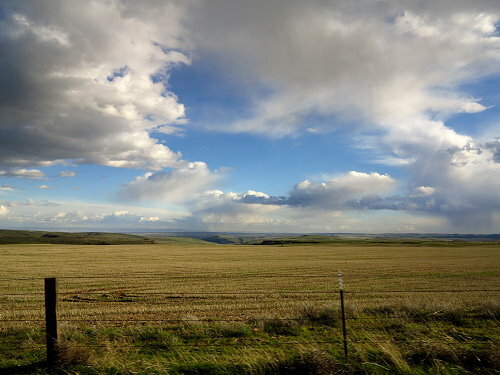 Once we exit I 90 to head south on highway 261 toward the state park, rolling hills of winter wheat are abundant, but soon the land becomes rugged and broken. 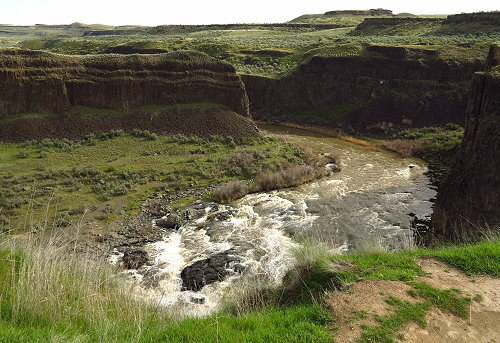 The Palouse River runs through a deep channel created eons ago as flood waters changed the topography of the land. 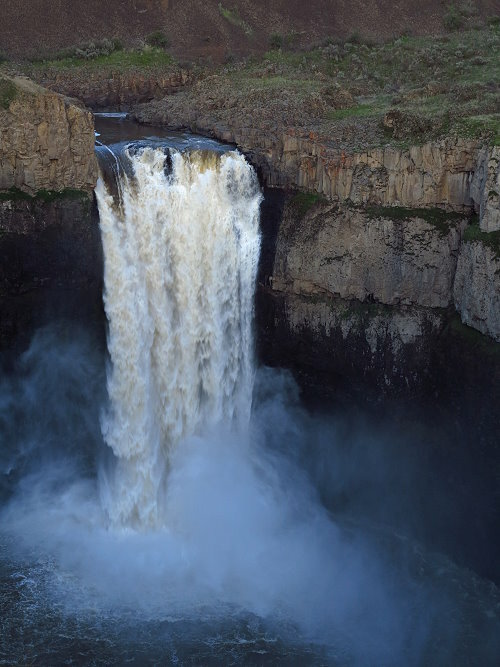 Upon arrival at the Palouse Falls State Park, the spectacular falls can be seen from the parking lot as the river races and falls from one gorge into an even deeper gorge. 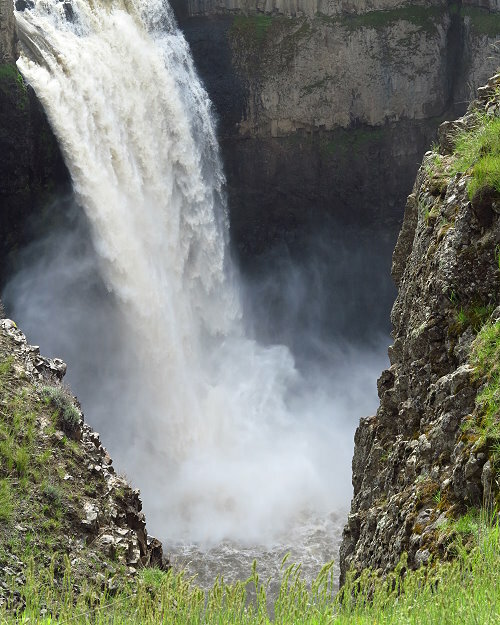 A fence keeps visitors safe from tumbling into the pool far below that forms at the base of the falls before the river dashes on. 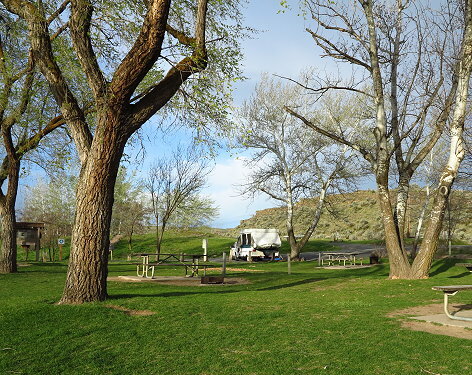 This park is designed more for day-use, but there are a couple of spots where we can park the Pony (our little pop-up) at the edge of the grass – a large lawn-like area with trees and picnic tables scattered here and there. We do a modified set-up this evening, as we will only be staying one night and don’t want to take the time to do a full set-up. It is not so convenient for cooking and doing dishes, but an easy dinner of soup, cheese and crackers is fine for tonight. Mr. Heater keeps us warm this windy chilly evening. 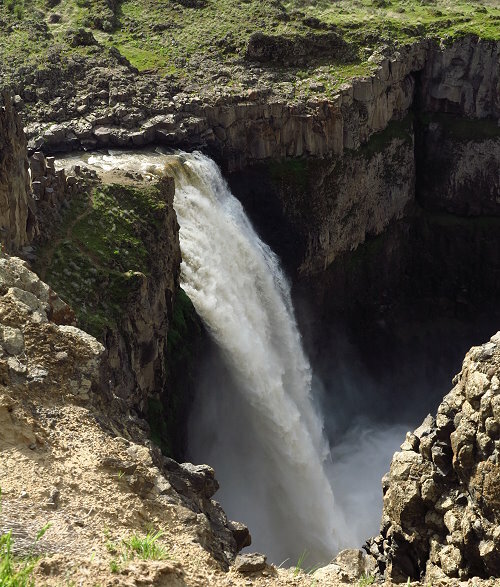 Wednesday April 1: I wake up before Clifford and decide to go for a stroll up on the cliffs above the waterfall – no fence here! 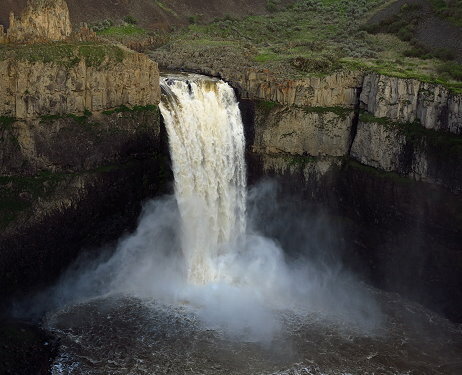 The sun has just risen over the bluffs behind the falls and as I walk along the cliff top, I have a great angle with the light hitting the falls, but not blinding the camera. Mist is rising from the pool due to the coolness of the morning, adding a special ambiance to the scene. I don’t go far, as I would like to share this walk with Clifford. 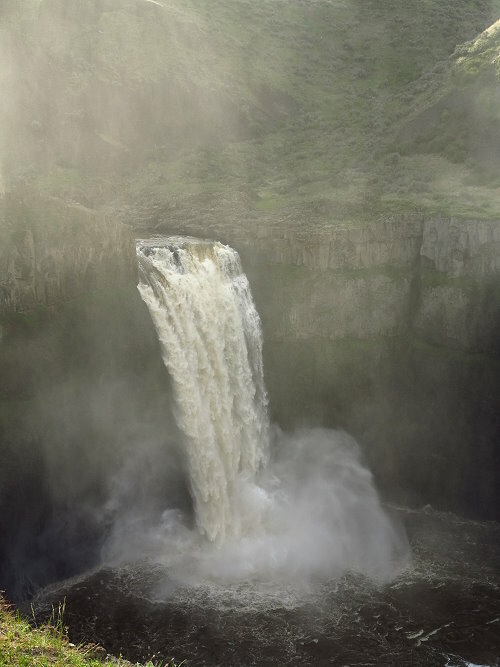 After an easy breakfast of yogurt and fruit, we walk together along the cliff and head upstream so as to see the river before it reaches its jumping off spot. 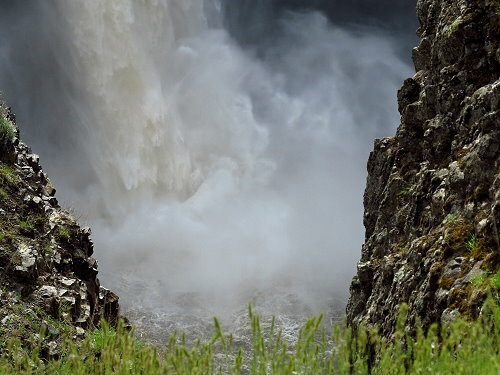 There is a very impressive cascade not far upstream and an unusual sharp bend in the course of the river, which we learn was caused by the cataclysmic events in the far distant past. We admire the river, the falls, and the rugged landscape before heading back to the Pony to get ready for the next leg of our journey.